Profilo is a paintable corner guard that makes it possible to create an elegant transition between different wallcoverings. In addition, it reinforces corners and makes wallpapering arches into child's play. Gaps in doors and windows can also be sealed with this corner guard. Profilo is a handy and durable solution with high decorative value. - Fold the corner guard into the desired angle and cut it to length. If the standard length of 2.60 m is not sufficient, a section of a second corner guard can easily be added on. - Affix Profilo to a clean surface while using an assembly adhesive. - Level out the transition between the corner guard and the wall using an indoor filler.This ensures that there is no difference in the levels of the two areas and that after wallpapering only the fillet is visible. - Paint Profilo (if required) in a colour that matches the wallcovering. Use paint that is suitable for PVC. 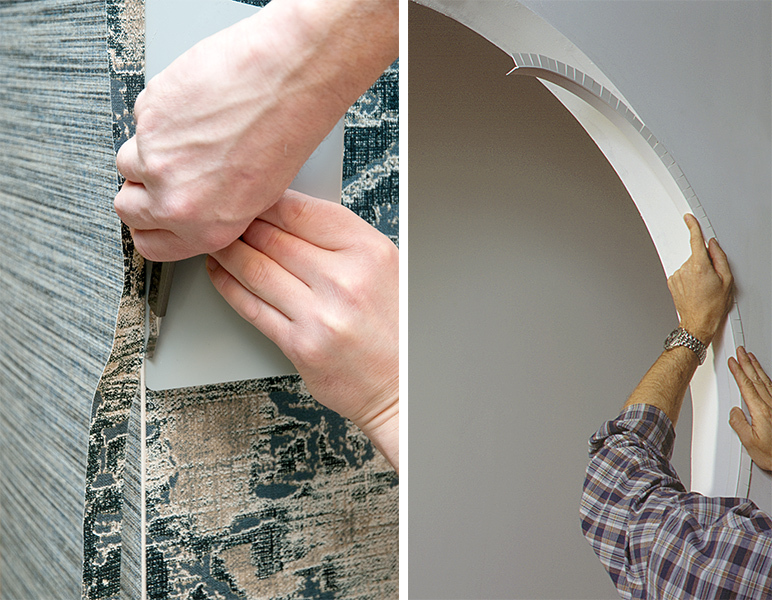 - Now affix the wallcovering to the raised part of the corner guard and cut away the surplus wallcovering.